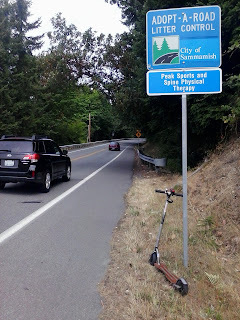 This has been a busy summer at the bike shop and often my days off from work involve relaxing by wandering around Issaquah with Christine, having breakfast at a local cafe or reading some terrific book. 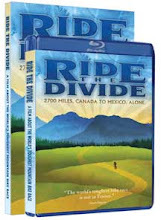 It's a good life but it doesn't generate a lot of compelling bike blog content, so I've been kind of quiet here. Christine still loves biking to work and we have a bike tour planned for September but these days I'm more likely to be seen scootering around town instead of biking. 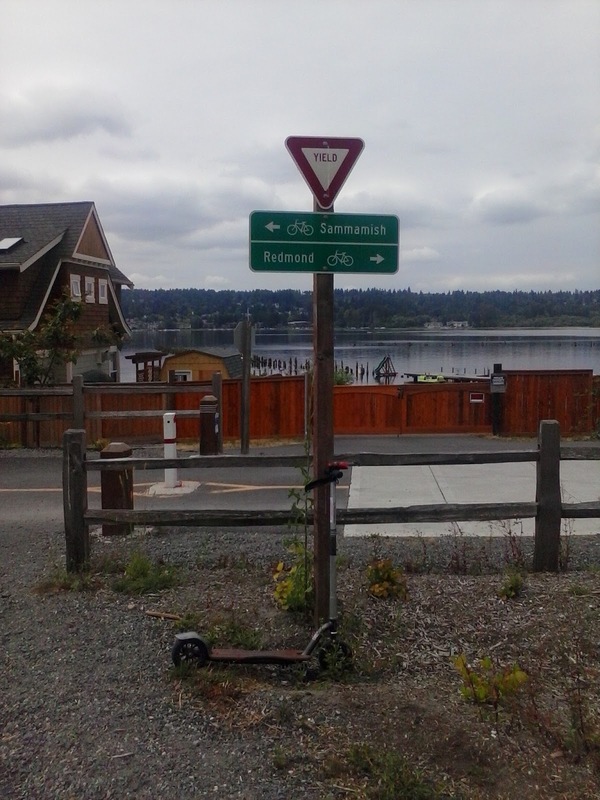 Yesterday, after a terrific breakfast, I hopped on my NYCeWheels KickPed and rolled out toward Redmond. 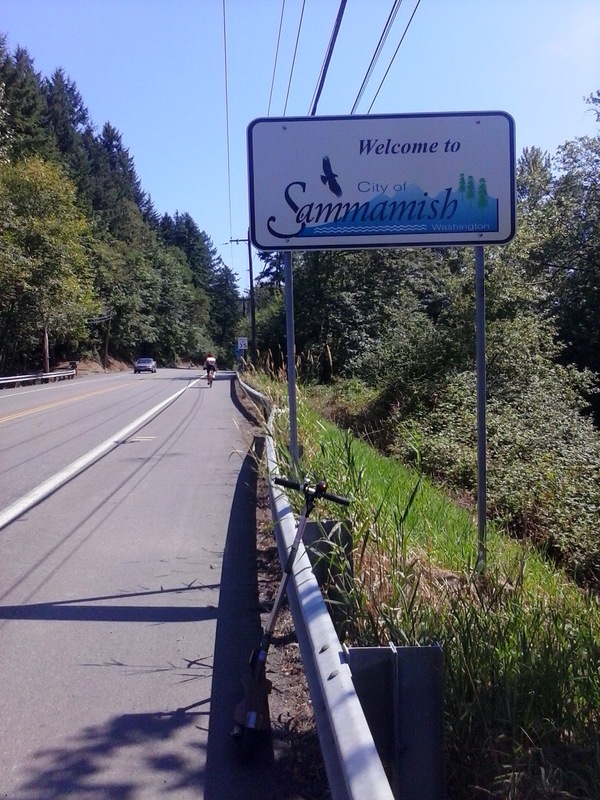 The trail from Issaquah to Sammamish is paved now, but at the Sammamish line it turns to gravel so I rode up the shoulder of the Parkway to Redmond. 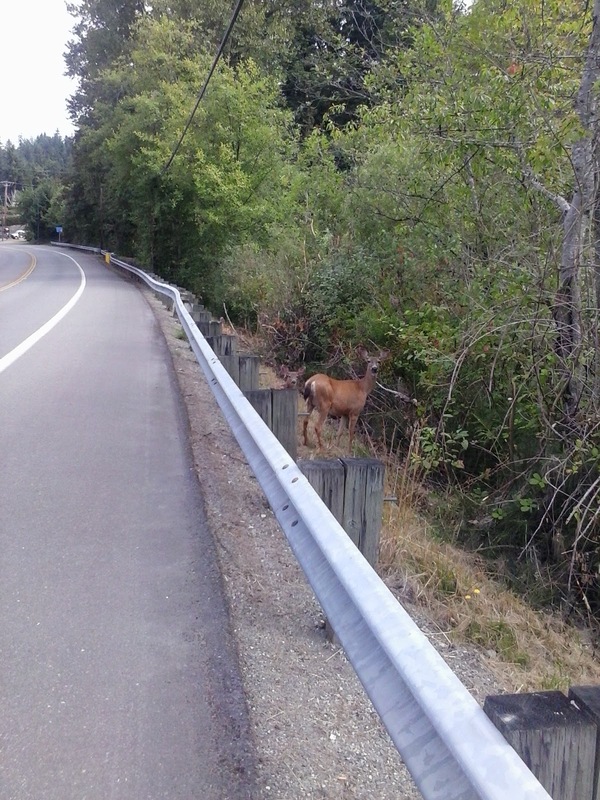 This mother deer had two fawns with her (if you look close you can see one behind her) and she acted like she'd never seen a man on a kick scooter before. 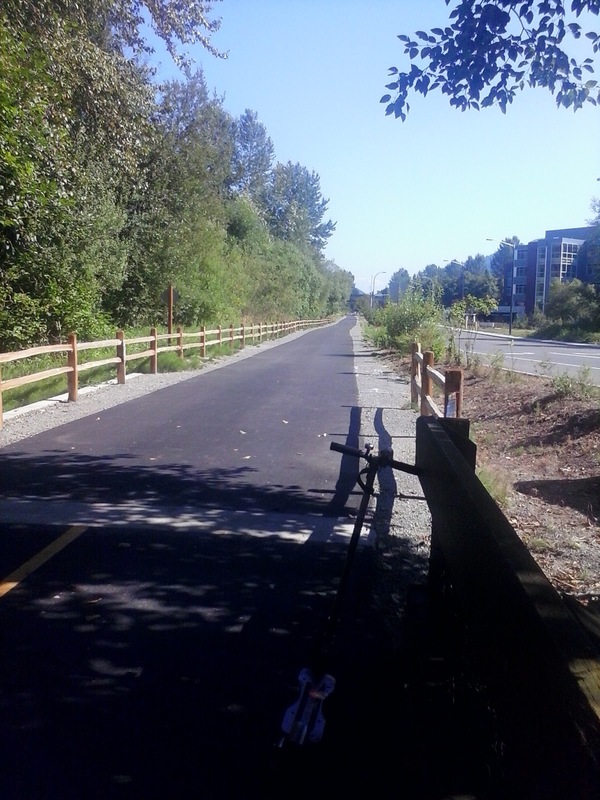 The trail pavement resumes at the Redmond town line. I stopped at a coffee shop and then headed over to the Redmond Library. 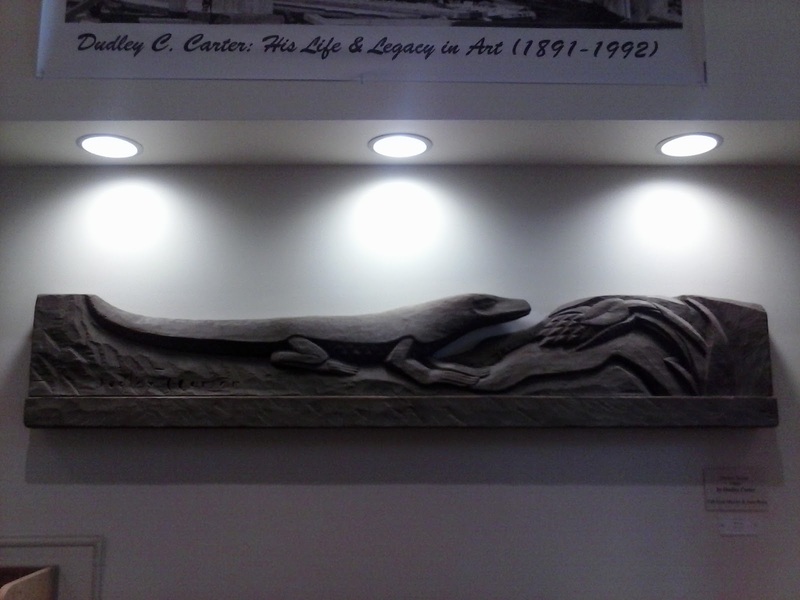 I like this little bit of art. 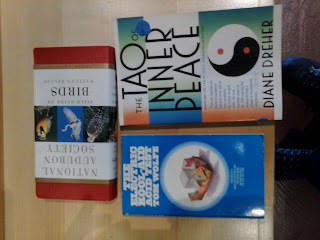 The Friends of the Library have a sale shelf and I got these three books for the grand total of $1.75. 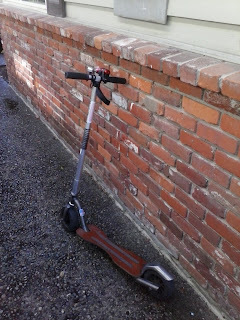 This is what old hippies like me spend their money on. I'm not the only one who uses a scooter to get around town. A kid who looked to be about three years old rolled up and parked his scooter at the bike rack just as I was leaving. 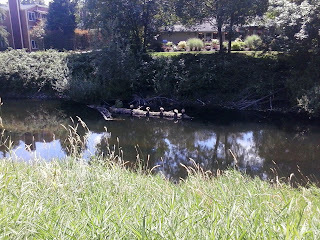 The geese were sunning themselves on a log in the Sammamish River. 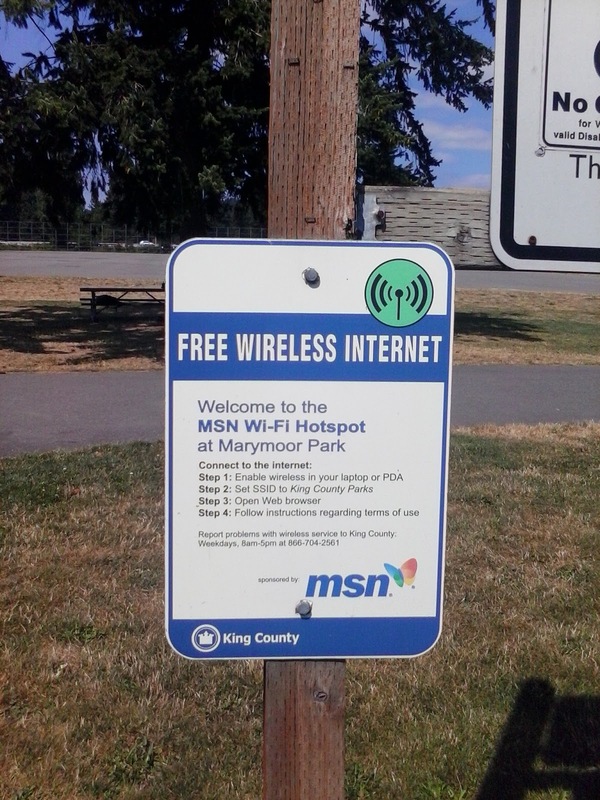 I rolled towards home through Marymoor Park. 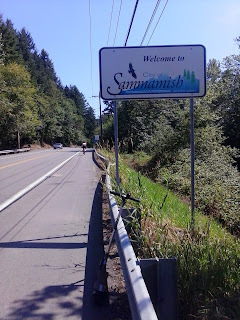 Back at the Sammamish line, I rolled back onto the shoulder of the Parkway. I tend to find things when I wander about. 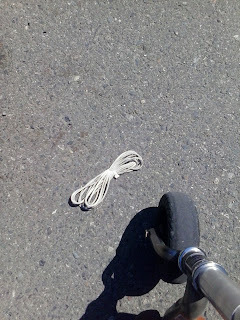 Yesterday's find was a nice bundle of nylon cord. This is the view south along the trail in Issaquah. 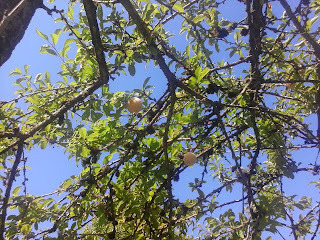 Along Gilman Boulevard, the peaches were ripe in the trees. I was almost home, but I stopped to eat three peaches. They were delicious. 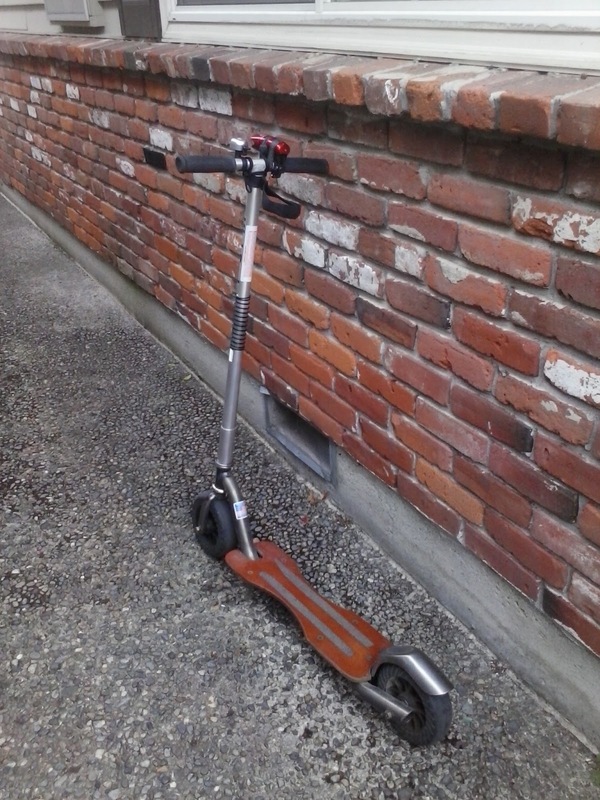 I'm still kind of amazed at how easy it is for me to rack up miles on the scooter. Google maps tells me the Redmond Library is 14 miles from my home, but it didn't feel far. It felt fun. The Oatmeal writes some very funny stuff and sometimes he writes some very wise stuff. (His wise stuff is also often very funny.) 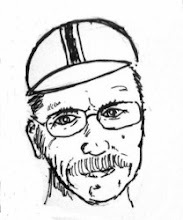 This piece about why he runs is wonderful. If you run or bike or ride a kick scooter or rollerblade or hike or whatever, I think you'll find some real value (and entertainment) in this post. For years Christine and I have used u-locks and while such locks provide a good level of security, they are bulky and heavy. Also a u-lock isn't very adaptable when it comes to locking your bike to unusually shaped objects. The Trelock FS 300 is a different kind of a lock, more secure than a cable, more flexible than a u-lock. When the folks at Cantitoe Road offered me a Trelock FS 300 for review, I took them up on their offer. At 750 grams the FS 300 is lighter than many u-locks. The lock consists of six metal plates that are riveted together. The plates are coated in a rugged plastic to keep the lock from scratching your bike and the rivets pinning the plates together look substantial. The lock folds into a compact package and comes with a nicely designed mount that can be either bolted to the bottle bosses on your bike or secured to your frame with some sturdy nylon hose-type clamps. The lock comes with two serialized keys and key replacement service is available. The locking mechanism is smooth and secure, consisting of a steel cam that rotates 180 degrees to completely capture the mushroom head of the last of the lock's pivoting plates. Folded, the lock is smaller than a water bottle and unfolded the sum of the length of the plates is 85 cm. 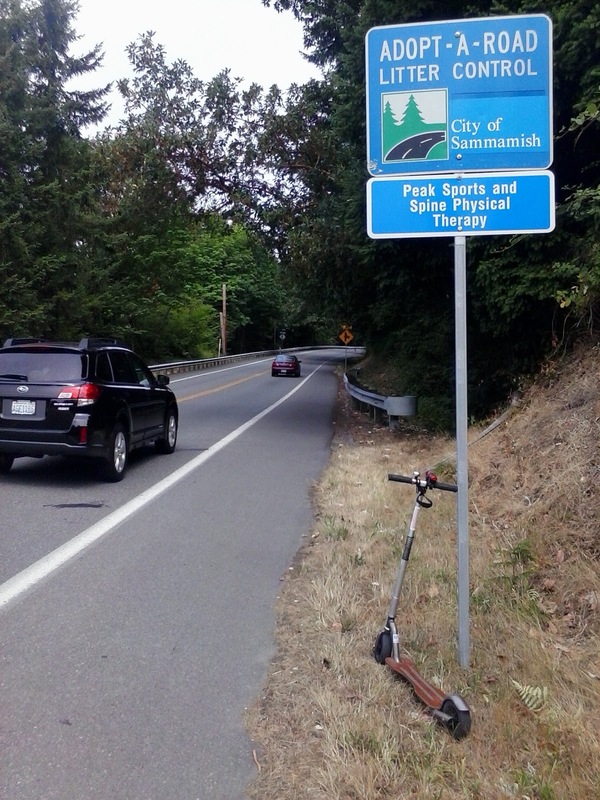 Christine has always preferred to use a Camelbak or a bottle that she carries in her bike basket, finding that more convenient than reaching down for a bottle crammed between the twin tubes of her Allant's compact frame. The FS 300 lock fits into that space perfectly. 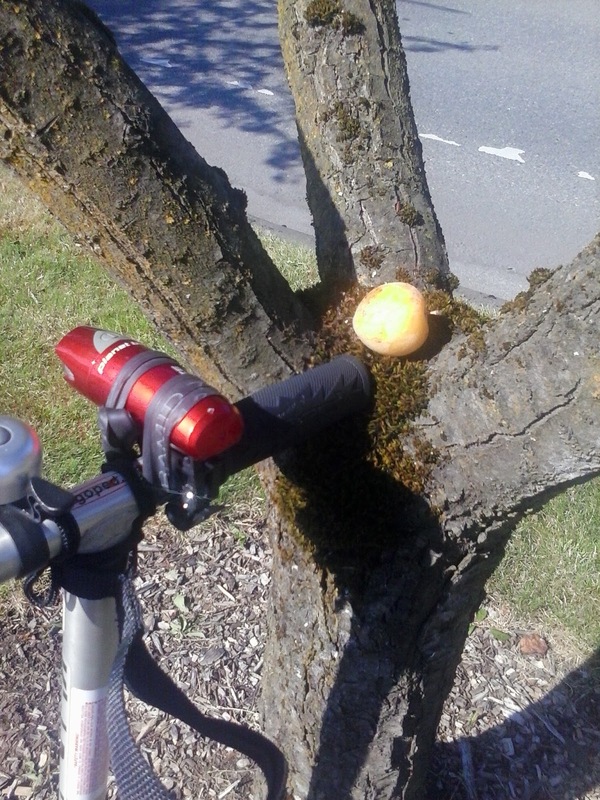 I have not tested the FS 300 by leaving a bike in a rough neighborhood overnight and I'm not going to destroy a perfectly good lock to see just how tough it is. My sense in examining the lock is that it could be defeated with some determined work with a saw, chisel, or a very big pry bar. While the manufacturer has a video showing the lock resisting a ton of leverage, I think a hardened steel u-lock is a better solution for the highest risk situations. 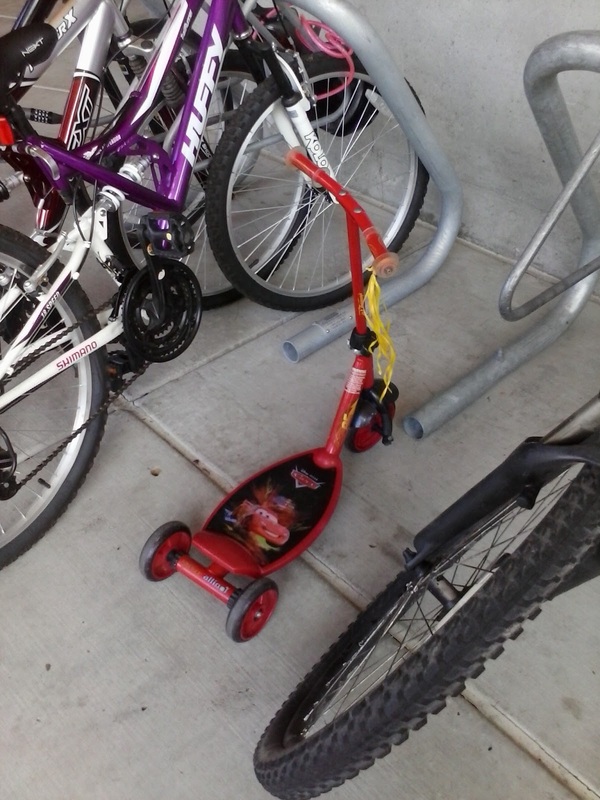 While u-locks may be the standard in security, they tend to be bulky and it's hard to find a good place to carry them, especially on smaller framed bikes. The FS 300 fits into tight places and is a good, medium security lock. and read. If you're like me, you'll find yourself nodding your head a lot.